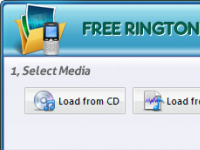 Free Ringtone Maker Platinum is able to load many kinds of sound files. You may input the music stored in your local folder and also, you are allowed to load the tracks of an audio CD. Numerous popular audio formats are supported like WAV, MP3, WMA, OGG, MP2, RAW, CDA, G721, G723, G726, AIF, AIFF, AIFC, MPGA & MPC. A wrong ringtone maker program may cause loading failure, which could easily lead to errors of operating system & unresponsive applications. Many ringtone makers are just not able to load music directly from audio CDs. Our ringtone creator helps you visually edit your music. You can visually select any part you want. You can zoom in to get a close-up view of your file or zoom out to see more of the waveform at a reduced size. Some artistic audio effects can be easily applied within 2 clicks. You can change the detailed parameters of the effects or use the presets for some popular settings. Some other ringtone makers do not provide you a visual interface to cut sound, instead, they give you a small window with numbers. You just can't figure out what your music "looks" like. With our cutter, you can see the change made to the waveform. Maybe your ex-tools do not provide you adjustable effects either, but for audio enhancement & perfection, parameter setting is indispensable - try our presets. It contains many features that enable you to do more than you expect. It can be used as an audio converter and an audio CD ripper. These functions save you a lot of time & money from finding other tools. It may take you hours to find an easy-to-use sound converter & a CD ripper. If you don't want to pay a few bucks for these two, our ringtone maker could be the replacement. Think about this: 1 FREE download to get 3 handy tools - isn't it worth a try? What's more, our free ringtone creator provides you 4 formats to output your ringtone: WAV, MP3, WMA & OGG. Some cell phones have very strict limit audio files used as ringtones, like, commonly, size & bit rate.